The basic form of interactive security is receiving real-time alerts on your smartphone (iPhone, Android, Blackberry) or tablet (iPad or Android). 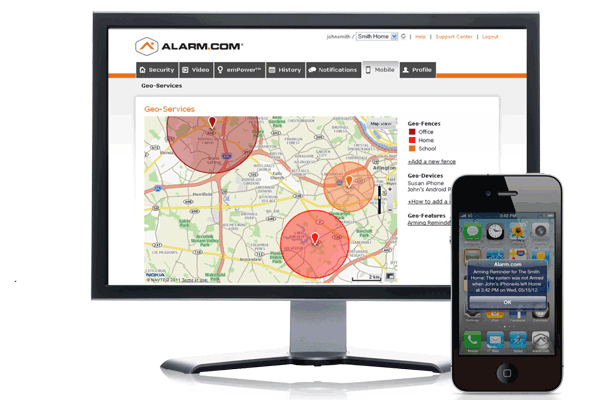 Receive both emergency and non-emergency notifications on your phone, alerting you to activity in your home. At home, it could be the kids getting home from school, the repairman showing up for a scheduled appointment or the toddler trying to get into the cleaning cabinet. For your business, it could be knowing the doors were locked after closing, that motion has been detected (complete with image) or when a particular employee showed up for work at the back door. Whether it’s being able to monitor the front counter at your retail store, ensuring the kids didn’t bring home extra friends after school, seeing who is approaching your home or checking in on your cat when you went away for the weekend, video surveillance has become essential. 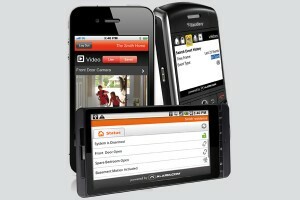 With our mobile apps, you can monitor live, scheduled or triggered video via stream or archive. There are many other safety and security elements that video surveillance allow and having that access from anywhere is valuable. 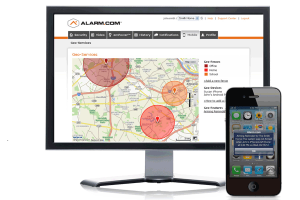 Geo-Services are a relatively new but wonderful feature to your security system. This feature allows you to set specific actions based on where you (or any family member’s mobile device you choose) are located. Leaving the house and forget to arm the security system? No problem, set a geo-fence up to automatically lock doors and arm the system when you’re a specific distance away. Concerned about energy expenses, but want the house comfortable when you get home? Set up a geo-fence around the office that knows when you’ve left and started the drive home, turning on the air conditioner. This automated remote-control element provides an additional safeguard for your security system as well as making it more useful in your daily life. The ability to control locks, lighting, appliances, thermostats and sensors provides convenience and knowledge. From setting a specific lock code for the neighbor to drop off the mail while your on vacation to turning on the lights when you arrive home after dark, being able to control your system from a smartphone or tablet makes the interactive security features beneficial for safety and peace of mind.